The generation and distribution of public information play a central role in the evolution of a strong democracy. Quality information is essential for effective governmental programs. The U.S. Constitution mandates a population census every ten years to apportion congressional representation. Land and water maps were necessary for defense, navigation, and planning the development of the frontier. By the late 1800s the Departments of Interior, Agriculture, and Commerce were charged with acquiring, analyzing, and disseminating environmental data for agency use, promoting business, and educating citizens. With the discovery of the germ theory of disease in the late nineteenth century, states began mandatory testing of public water supplies. In the twentieth century, government rapidly expanded as the population grew and the economy was transformed from agricultural to industrial. Rapid increases in energy and chemical use were soon followed by widespread problems of pollution. Public concern led to increased regulation. From the 1970s onward major environmental laws were enacted to protect human health and the ecosystem. Each regulation contains specific data requirements that classify substances, and document location, utilization, and dispersal. The result is that numerous agencies now collect, process, and disseminate environmental information. Public data acquisition is shaped by four factors: legitimacy, resources, access, and will. Agencies can only collect data that meet a specific program objective, such as a metropolitan smog reduction program requiring automobile exhaust testing. Compiling data requires staff, equipment, and travel. Most monitoring programs rely on statistical sampling, and some have insufficient budgets to meet desired quality standards. Pollution often involves activities by private enterprise such as manufacturing. Governments must follow strict procedures before entering these facilities to collect data. Periodically, elected and appointed officials decide not to mandate data collection activities that are unpopular with constituent groups including businesses, farmers, or homeowners. Elected officials and agency administrators are accountable to the public. As government grew, program complexity hindered information access. In 1946 the Administrative Procedures Act (APA) required agencies to make public for review and copying its organization description, decision processes, data collection procedures, and lists of data sets (record series). In practice, however, data access was often denied. Requestors were required to document their intended uses ("need to know"). Rachel Carson encountered this roadblock while researching how DDT was deforming and killing wildlife for her book, Silent Spring. In 1966 Congress amended APA with the Freedom of Information Act (FOIA). It establishes a broad public "right to know," requiring agencies to process a data request unless it conflicts with one of nine categories of specific exclusion such as national defense. FOIA entails a specific written request and often takes months to process. Most states also now have similar APA and FOIA laws for state and local agencies. When FOIA was enacted, computers were not widely available. The digital information revolution has dramatically changed all aspects of data acquisition, analysis, and dissemination. FOIA was amended in 1996 as the Electronic FOIA (E-FOIA) to expand the definition of "records" to include digital files, and requires agencies to create Internet-based electronic reading rooms, where the public can locate, access, and download frequently requested data without filing a formal request. In response to the factors that shape the government's ability to collect data, a variety of alternative approaches have been developed to facilitate the creation of pollution-related information. First party data are acquired directly by a government agency. This approach is well suited to long-term programs designed to assess environmental change. For example, New York state operates a network of air pollution monitoring stations. Much pollution emissions data, however, are second party. That is, regulations require businesses to self-monitor their discharges and report them to the appropriate governmental unit in a standard format to become part of the public record. Most land disposal, air, water, and hazardous waste permits are of this type. Under the Emergency Planning and Community Right-to-Know Act (EPCRA), businesses must report chemicals stored on-site to local emergency response committees, and annually report pollution releases to the states (the Toxic Release Inventory, TRI). Some hazard data are third party, with the government requiring the exchange of information between two private parties. For example, Florida requires home sellers to test for radon, and report the results to prospective buyers. Unless specified, third party information is typically not a public record. A fourth approach, increasing in importance, is field monitoring programs conducted by not-for-profit groups and academic institutions under the technical guidance of a government agency. The National Environmental Policy Act of 1970 (NEPA) states that citizens have a major responsibility for creating a healthy environment. Challenges such as the nonpoint pollution of water supplies need locally based continuing data collection. Citizens are then prepared to take proactive roles in management decisions. These programs often combine chemical analyses with the recording of bio-health indicators such as stream organisms. Examples include the Pennsylvania Alliance for Aquatic Resource Monitoring and the Rivers of Colorado Water Watch. Most federal and state environmental data are now available in a digital format. Typically, the data have two components: spatial (map) location, and descriptive data table attributes such as date, chemical type, and amount or concentration. Initially, each pollution program such as air emissions or Superfund, was managed with an independent database. This presented major difficulties in combining information across programs. 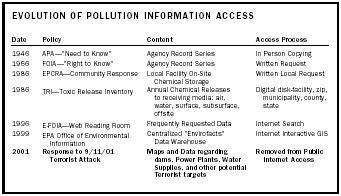 The establishment of a mandated Toxic Release Inventory (TRI) was a major innovation, integrating multimedia pollution data. In recent years the Environmental Protection Agency (EPA) has integrated databases in its "Envirofacts" data warehouse. With the advent of the Internet, the user interface for selecting information has become highly flexible and interactive. EPA's TRI data can be accessed by geography (zip code, county, state, or nation), chemical, industry sector, or year. Users can also specify the type of report desired, such as a trend analysis. The agency's EnviroMapper program uses an interactive geographic information system (GIS) that allows point-and-click zoom access for location selection. The user can then select which data to display. In addition to data dissemination, public agencies and some nonprofit organizations are now using the Internet to communicate summary analyses of environmental quality. EPA's GIS-based "Surf Your Watershed" creates a multifactor index of water indicators (IWI) "scorecard" total for current quality and future vulnerability. Graphs of factors can also be produced. Many innovative approaches to disseminating pollution information are being developed around the world. Canada's National Water Resource Institute has developed the RIASON system for local and international use that integrates multiple databases, GIS, and analysis capabilities. It has been used to assess acid rain in North America, and protect rural water supplies in African Lake Malawi (Lake Nyasa). In England, the U.K. National Air Quality Information Archive Web site provides interactive access to historical and current monitoring data, including health alert bulletins. Environmental management is a shared responsibility of the public, business, and government. The public continuously makes consumer choices such as where to reside and what herbicides to use based on available information. Citizens also participate as partners in local pollution monitoring and environmental restoration projects. Businesses use pollution data to improve competitiveness through better manufacturing practices. Governments use the data for advancing the scientific understanding of complex systems, for establishing and enforcing standards, and for education. Open access to pollution information plays a critical role in shaping public policy. Locally, information provides the foundation for land-use plans, emergency response, Brownfield cleanup, the protection of community water supplies, and the issuance of health alerts. At the state and national levels, pollution monitoring is essential for measuring the effectiveness of existing programs and establishing the need for new interventions. Pollution knows no political boundaries. Global warming, ocean dumping, and safe drinking water challenge the sustainability of the planet. The United Nations Environment Program is leading the collaborative effort to establish standardized, long-term public and private global monitoring and data sharing. SEE ALSO GIS (G EOGRAPHIC I NFORMATION S YSTEM ) ; R IGHT TO K NOW . Chemical Safety Information, Site Security and Fuels Regulatory Relief Act (CSISS FRRA). (1999). 42 USC 7412 (r). Cole, Luke, and Foster, Sheila. (2000). From the Ground Up: Environmental Racism and the Rise of the Environmental Justice Movement. New York: New York University Press. Department of Justice. (1966). Freedom of Information Act (FOIA). 5 USC 552 et seq. Felleman, John. (1997). Deep Information: The Role of Information Policy in Environmental Sustainability. Greenwich, CT: Ablex Publishing. Liu, Feng. (2000). Environmental Justice Analysis: Theories, Methods, and Practice. Boca Raton, FL: Lewis Publishers. McClure, Charles; Hernon, Peter; and Relyea, Harold. (1996). Federal Information Policies in the 1990s. Norwood, NJ: Ablex Publishing. Alliance for Aquatic Resource Monitoring Web site. Available from http://www.dickenson.edu/storg/allarm . Rivers of Colorado Water Watch Web site. Available from http://wildlife.state.co.us/riverwatch . U.S. Department of Justice. "Freedom of Information Act Guide." Available from http://www.usdoj.gov/oip . U.S. Environmental Protection Agency. "Envirofacts Data Warehouse and Applications." Available from http://www.epa.gov/enviro .